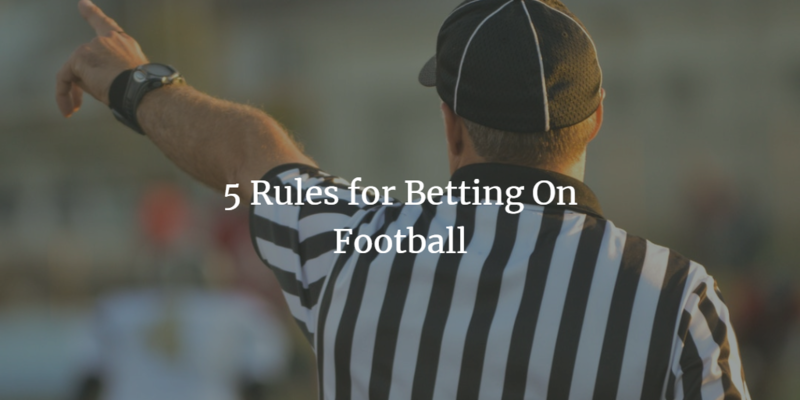 Like most things in life, there are rules to football betting. Unlike, of course, laws that govern a state that has consequences if broken, the rules of betting do not have external consequences but yes, there are consequences for not knowing and abiding by the rules in betting. Betting is a game and people are there to win. Don’t bet with your emotions: Emotions are good when we are talking about matters of the heart, like falling and love and showing love to the one you love. Even for issues of love, letting the head win once in a while is very advisable. With football betting, you cannot allow your heart rule over your head, except you do not care about making profits. Most bettors have a team they support; after all, it is usually fans of football that bet on the game. So, it is normal and expected that you have a team you support for whatever reason, ranging from the color of their uniform, some of their players, their coach, to the fact that you have been following them for years. However, when it comes to betting, don’t let your love for them blind you to the reality of what the outcome of the game might be. If from your logical analysis, the team you hate have a better chance, then you should consider betting on them than a betting on a team simply and only because you love them. Research: You need to do a lot of research as well. In all honesty, there is a place of luck in betting but luck is not all it is cut out to be, there is also a lot of analyzing that goes on. Professional tipsters, for instance, who give daily predictions do not seek a soothsayer for their predictions, they do proper analysis based on research. So you can do the same. The internet has provided a great opportunity to load information from the comfort of your house, all you need do is log in. If you are serious about making profits on betting, then you need to spend some of your time doing research on social media about how the analysis is done (current form of the team and certain players, injuries, stats, home and away records and so on) and also get ideas from the professional tipster. There is no good report without proper preparation. Proper preparation in the form of research provides you with a good chance of making profits. Be Financially Disciplined: You need to be a good manager in order to make profits in betting. You cannot afford to spend your money loosely if making money is your goal. So it is important you come up with a plan and follow it strictly. The plan should guide the amount of money you spend or betting and the amount of money should be dependent on how much you can afford to lose. Don’t bet the money set aside for bills with the hope that you will win. Even if you are 100% sure of your prediction, betting is a high-risk game, don’t bet more than you can afford to lose. Try as much as possible not to be greedy and be patient. The idea is not to bet all your savings at once to expect returns, the idea is to be strategic and then patient. Bet on Leagues or Teams You Know About: There are so many football leagues around the world and you cannot possibly know them all or follow all closely. Even if you watch all their games, there are a few or one you are very knowledgeable about, those are the ones you should follow. This is because betting is a game of proper analysis and you cannot make a proper analysis on what you don’t fully have knowledge on. Some bookies might want to convince you to bet on leagues you know nothing about, don’t fall for it. Stick to leagues and teams you follow and can make proper, logical analysis about. Don’t Get Carried Away by Trends or Large Following: Certain clubs can get bet on because they have a large following or for whatever reason, don’t follow the crowd. The fact that the crowd is tilting towards certain odds doesn’t mean you have to. On the other hand, that does not mean you should adamantly not follow the crowd if you have logically analyzed that the crowd is right. At the end of the day, the point is are you betting on a certain team because the crowd is and it is the present trend or is you betting on them because based on your analysis, you feel they are worth betting on. As humans, it is normal to be swayed by popular opinion but you are not to allow yourself be swayed, especially if it is your goal to make a profit. As said earlier, this list is not exhaustive and there are many other rules to follow if you want to make a profit through betting. However, this list contains five pertinent rules that you should take to heart is making a profit on your bets is your goal.